To make the curry sauce, heat the oil in a medium saucepan over medium heat. Add the onion, garlic, ginger and apple and cook, stirring, for 6–8 minutes or until soft. Add the curry powder and flour and stir for 1 minute. Whisk in the stock, soy sauce, honey and Worcestershire sauce. Reduce the heat to low and cook, stirring occasionally, for 6–8 minutes or until thickened. Set aside and keep warm. using a meat mallet, pound to ½cm thick. Place the flour, salt and pepper in a medium bowl and mix to combine. Place the eggs, milk and sesame oil in a separate bowl and whisk to combine. Place the breadcrumbs and sesame seeds in a third bowl and mix to combine. Dust the pork with the flour mixture, dip into the egg mixture and press into the crumb mixture to coat. Heat 3cm of the oil in a large frying pan over high heat. Cook the pork in batches, turning, for 3 minutes or until golden and cooked through. Drain on paper towel. 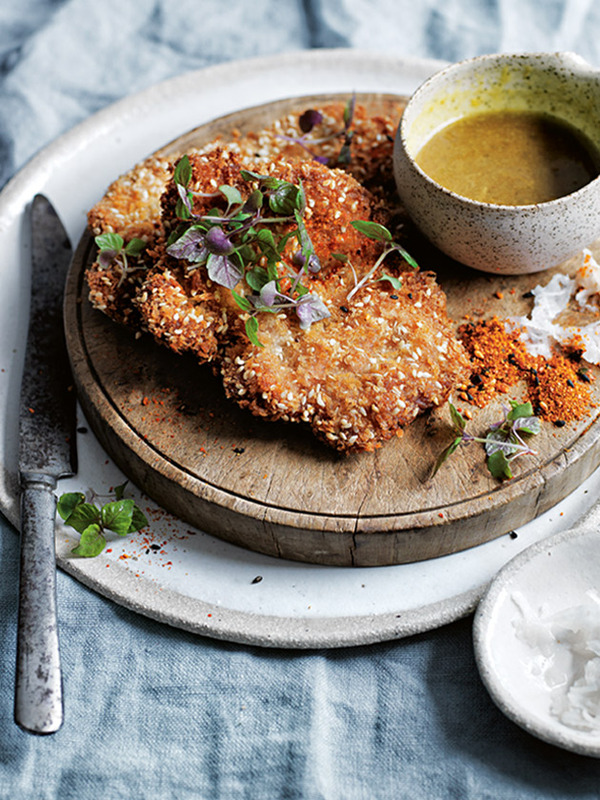 Divide the schnitzels between serving plates and top with the daikon, togarashi and shiso. Serve with the curry sauce. Serves 4. This recipe was great. Too much curry for me personally, so i would probably half that the next time i make this. It overpowers the entire flavour in the sauce. I would definitely recommend making the sauce a day in advance - the flavours need time to develop. Yum!